What Is Lubricant Oil Soot? 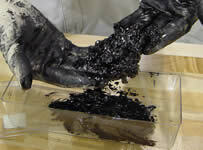 - Analytical Engineering, Inc.
Lubricant soot is a by-product of diesel combustion. Soot is formed in fuel-rich, cool regions of the combustion chamber and impinges on the cylinder wall, where it is scraped into the engine oil sump by the piston rings. Soot is partially burnt fuel which results in a heterocyclic hydrocarbon particle. Upon entering the engine oil sump, the soot is rapidly mixed in with the bulk oil and circulates throughout the engine. As oil passes through the engine gears, the soot particles are ground into extremely fine particles, nominally 1000 Angstroms, and are maintained in suspension by the lubricant dispersants. The soot will remain homogeneously suspended in the oil, until the soot concentration reaches a level great enough that it precipitates out of the oil. This may also result in filter plugging. Oil formulations which have high dispersancy levels will keep the soot in suspension to higher concentration levels. Soot is a non-classical abrasive. It will erode boundary lubricated surfaces at high concentrations. This will cause severe engine wear. Some symptoms of soot induced wear include tappet polishing, cam lobe wear, rocker/crosshead wear and ring wear at top and bottom reversal locations.